The minute I met Scott Beare, I liked him. Mac Anderson, who had arranged our lunch meeting, said I would...and he was right. The Blue Angels stories that Scott shared that day, in his honest and straightforward demeanor, were exhilarating to say the least. Not only is he a straight shooter with a great story, Scott's modest, too. It wasn't until weeks later he happened to mention that he was the first enlisted Navy man to become a Blue Angels pilot. And it was only recently that I learned Hasbro had based its GI Joe Blue Angels Action Figure on Scott's likeness. In the context of teamwork, this point may seem insignificant, but having had GI Joes as a kid, I think it's pretty cool. As Scott and I began this project, we quickly discovered the number of books, articles, videos and programs devoted to teamwork was staggering. Upon further review, we concluded most of it was based on the same old "teamwork" rhetoric—just repackaged. We had no need or desire to rehash or repackage anything. After all, our content was original and based on the world's best flight performance team—the Blue Angels.Ultimate Team. During our many meetings, one thing became clear—what the Blue Angels consider normal "teamwork" may be difficult for most people to comprehend. To say it's above average seems understated; better put, it's abnormal. It's well outside the bell curve and hard for the "normal" person to relate to at times. Sigmund Freud believed by studying the abnormal, we could gain a better understanding of the normal. Thinking along these lines, I thought by offering a glimpse into the Blue Angels' concept of teamwork, perhaps we can gain a better understanding of teamwork as it relates to our own lives. But as the months went by, I noticed something strange taking place. We were telling our story using the same words everybody else did—words like trust, respect, integrity, values, accountability and so on. Somehow, quite unintentionally, we had transformed our original Blue Angels content into the same old teamwork rhetoric we've all heard before. It didn't make sense. But, I knew one thing for certain...neither of us was interested in creating a book with recycled content. verbal commands, the mechanics who service your engine, the guys who inspect your gauges, and all the others responsible for any number of details? As a Blue Angels pilot, the word trust carries significant meaning...to an abnormal degree. Recognizing this, many of the words in our book may appear similar to those used by others writing about teamwork. But don't be confused by spelling and pronunciation. I've been on many teams throughout my life—baseball, football, track and wrestling—creative teams, work teams, sales teams, and the like. But the definition of teamwork adhered to by the Blue Angels is outside my scope. To Scott Beare and his teammates, these common words used to describe teamwork, the ones we've used to write this book, are far from common. As you read them, ask yourself, as I have numerous times throughout this project, what these words mean to you. What do they represent to the members of your team? Once our definitions begin to align with those of the Blue Angels, we can be confident we're ready to operate at peak performance...and understand the true The Power of Teamwork with FREE DVD. "Synergy" is a phenomenon where the whole is greater than the sum of its parts. It helps to explain the power of teamwork and why teams must have the right people in the right places—all focused on achieving a common goal. That's why the Blue Angels have clear objectives and select from only qualified candidates capable of consistently operating at peak performance. the right to wear the crest. Nothing short of this extreme commitment to the team is tolerated or accepted. Are the right people in place on your team? Do you capitalize on synergy? Do you have complete trust in your team members? Do you make the team? •The The Power of Teamwork with FREE DVD on teamwork by the ultimate team. •You will be amazed how the same teamwork principles used by the Blue Angels will apply directly to you and your business. •Breathtaking photography and graphic design, make the messages within this book leap right off the pages. operating at peak performance levels. 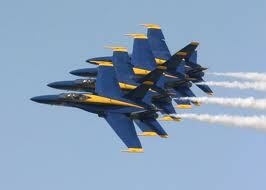 Get your team ready for peak performance when you apply the nine principles of teamwork used by the Blue Angels. No pilot license needed -each principle ties back to what it means to your company and your team. This beautifully designed gift book written by Blue Angel pilot, Scott Beare and award-winning designer Michael McMillan, will "knock your socks off." The Power of Teamwork with FREE DVD is filled with great stories and great graphics are used to reinforce the nine key principles of teamwork used by the Blue Angels. And, each principle ties back to what it means to your company and your team. When your definitions of teamwork align with those of the Blue Angels, you are really ready for peak performance. This is a great book for every person in your organization to truly grasp the power of teamwork. Play this movie at your next team meeting and give a copy to each member to drive home the message.